The gold and silver coins featured in the section above are among the best-selling coin series available online from JM Bullion. We strive to purchase precious metal coins from sovereign and private mints around the globe with the strongest brand recognition. Each of these coins comes from a trusted mint and is part of a coin series that investors buy in millions with each release. From intricate designs on investment-grade bullion coins to low mintage figures for collectible versions, these gold and silver coins for sale generate the most interest each year. Most of these products come from internationally-recognized sovereign mints. 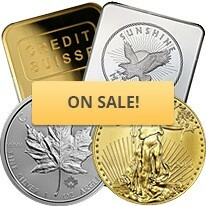 The United States Mint, Royal Canadian Mint, Royal Mint of England, Australia’s Perth Mint, the Chinese Mint, Sunshine Minting, and PAMP Suisse are just some of the many leading bullion brands you’ll find silver and gold for sale from that are intensely popular. The United States Mint’s American Eagle Coin series is one of the most diverse in the industry. Launched in 1986, the American Eagle Series includes bullion and proof versions for each coin in the collection. The debut year featured an American Gold Eagle coin with bullion options in 1 oz, 1/2 oz, 1/4 oz, and 1/10 oz weights, along with a 1 oz proof coin. That same year saw the introduction of the American Silver Eagle coin with a 1 oz bullion option and a 1 oz proof coin. By 1988, the American Gold Eagle had expanded to include the three fractional weights. In 1997, the American Eagles expanded to feature an American Platinum Eagle coin. The Platinum Eagles were available from 1997 to 2008 in 1 oz, 1/2 oz, 1/4 oz, and 1/10 oz weights in both bullion and proof. The bullion coins were not struck between 2008 and 2013. The coins returned in 2014, were not struck in 2015, and have been issued each year since 2016 with just a 1 oz weight. The Proof Platinum Eagles continued after 2008, but were available only as a 1 oz platinum coin. The most recent addition is the American Palladium Eagle coin. Debuting in 2017, these 1 oz coins were available at first only as a bullion coin and again in 2018 as a proof coin only. With countless options for investors, the American Eagle coins are in constant demand from investors. The 2015 American Silver Eagle set a bullion sales record with 47 million coins sold in that one year and the two issues of the American Palladium Eagle (2017 bullion and 2018 proof) both sold out. In the North American market, in particular, the Canadian Maple Leaf coins are second in popularity and demand only to the American Eagle coins. While American Eagle coins each have unique images of Liberty on the obverse and the American bald eagle on the reverse, all four versions of the Canadian Maple Leaf coin share obverse and reverse designs. The reverse side always features the sugar maple leaf design first created in 1979 by Walter Ott for the Royal Canadian Mint. Queen Elizabeth II features in right-profile relief on the obverse in portraits that are regularly updated to reflect her age. In 1979, the Canadian Gold Maple Leaf debuted with a 1 oz coin that featured .999 pure gold content. The 1982 issue resulted in the addition of 1/4 oz and 1/10 oz coins, with an increase in purity to .9999 pure gold. In 1986, a 1/2 oz coin was introduced followed by the 1/20 oz coin in 1993. Other versions of the Canadian Maple Leaf includes the 1 oz Silver Maple Leaf introduced in 1988 as the first-ever .9999 pure silver coin. Canadian Platinum Maple Leaf coins debuted in 1988 as well and were struck until 2002 in 1 oz, 1/2 oz, 1/4 oz, and 1/10 oz options. Since 2009, the coins have been struck only in 1 oz .9995 pure platinum. Canadian Palladium Maple Leaf coins were first minted in 2005 and feature 1 oz of .9995 pure palladium. From the Royal Mint of England, the Britannia bullion coins are available in gold, silver, and platinum. The Gold Britannia was the first coin issued in 1987 with 22-karat gold content. In 2013, the Royal Mint increased millesimal fineness to .9999 pure gold content. The coins now consist of 1/20 oz, 1/10 oz, 1/4 oz, 1/2 oz, 1 oz, and 5 oz gold coins. In 1997, the Royal Mint introduced the 1 oz Silver Britannia. This coin was available from 1997 to 2012 with .958 silver content, but since 2013 features .999 pure silver. More recently, the Platinum Britannia debuted in 2018 with a 1 oz and 1/10 oz coin. Each release in the series features Philip Nathan’s design of Britannia on the reverse and an effigy of Queen Elizabeth II on the obverse. The Chinese Mint issues one of the world’s most popular bullion coins. The Gold Panda debuted in 1982 with 1 oz, 1/2 oz, and 1/4 oz coins. In 1983, the 1/20 oz coin was added. Beginning in 1983, the Silver Panda was issued with irregular weights and purity levels. Starting in 1987, the Chinese Mint stabilized the weight and purity at 1 Troy oz of .999 pure silver. Since 1989, the Silver Panda has been issued as an investment-grade silver bullion coin. What makes both the Gold Panda and Silver Panda unique among its counterparts is the changing design of the Giant Panda on one side of the coin. Shared across the gold and silver releases, investors and collectors alike treasure the changing designs of the Giant Panda each year. Without a doubt, one of the most coveted coins in the world is the South African Krugerrand. The world’s first-ever gold bullion coin, the Krugerrand was issued in 1967 as a private vehicle for gold ownership and investment. From 1967 to 1979, the South African Mint issued only a 1 oz gold coin. Starting in 1980, the mint expanded the series to include 1/2 oz, 1/4 oz, and 1/10 oz coins. On the 50th anniversary of the series in 2017, the South African Mint issued its first-ever Krugerrand coins in other metallic options. In 2017, a Premium Uncirculated Silver Krugerrand debuted and a bullion Platinum Krugerrand was also issued. Both coins were available only for the 50th anniversary, but the Silver Krugerrand’s popularity led the South African Mint to develop and release both a standard bullion and proof coin starting in 2018. If you have any questions about the top sellers in the precious metals market, please feel free to reach out to JM Bullion. Our customer service team can answer your questions at 800-276-6508, online using our live chat, and via our email address.